Poker once again got to show its charitable side over Christmas courtesy of professional player Bernard Lee and The Full House Charity Program. Established in 2011, The Full House Charity Program awards at least $10,000 to worthy causes in New England each year and handed out festive treats to 50 children from Milford, Massachusetts, on December 20. Goodies included winter clothes, books, Sports Illustrated For Kids magazines, board games, sports balls, art supplies, stuffed animals and toys. "I'm thrilled to bring The Full House Charity Program to a new location this year," said Massachusetts native Lee. "My family and I were excited to meet new families and help them celebrate the holiday season. It gives me great joy to see the children smile when we hand them their packages. 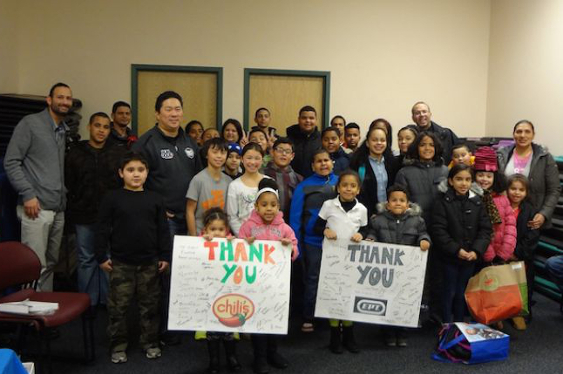 I'm so grateful my good fortune in the poker world allows me to give back to the community." Lee hosts his own show on Rounder's Radio and revealed that other organisations involved in his latest Christmas giveaway included Chili's Grill and Bar Restaurants and the Eastern Poker Tour, an amateur regional poker league. "We are excited Bernard could join us at the Milford Youth Center to celebrate the holiday season with some of our families," said Sidney De Jesus, Director for the Milford Youth Center. "It is heartwarming to watch giving in action and to know the children we serve each day are benefiting from the generosity of others."